iftineducation.com – Washington Gov. Jay Inslee blasted President Donald Trump’s executive order banning people from certain Muslim-majority nations as “unjustifiable cruelty,” and about 1,000 pro-immigration protesters gathered Saturday at Seattle-Tacoma Airport. Attorneys from the ACLU and the Northwest Immigrant Rights Project said a Somali national was not allowed to enter and two other people were detained at the airport. Doug Honig, a spokesman for the ACLU of Washington state told the Seattle Times that U.S. District Court Judge Thomas Zilly in Seattle granted a motion for an emergency stay of the executive order to prevent the two people who were detained from being sent out of the country on flight to Dubai. Trump signed an executive order Friday that bans legal U.S. residents and visa-holders from seven Muslim-majority nations from entering the U.S. for 90 days and puts an indefinite hold on a program resettling Syrian refugees. At a fiery news conference denouncing Trump’s order, Inslee said he had met with a woman, a U.S. citizen, whose husband was denied entry at Sea-Tac airport after flying from Vienna. It wasn’t clear if Inslee was speaking about the same traveler or if multiple people were detained. The United States “allowed her husband to get on a plane in Vienna but didn’t let him go the six feet across this gate to embrace his wife,” Inslee said of the man. 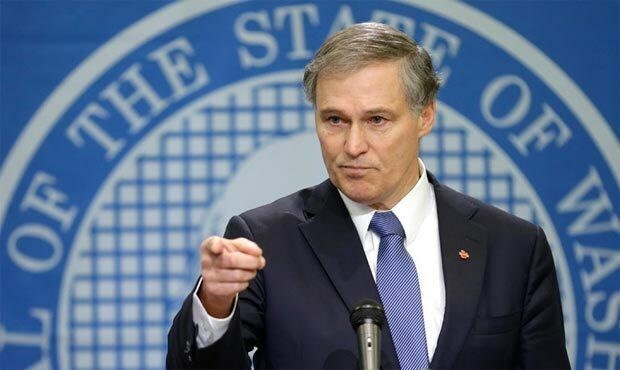 Inslee said he was trying to get details on those turned away and had spoken with someone in the Trump administration by phone. He compared Trump’s order to the detention of Japanese Americans after the bombing of Pearl Harbor. “The manifest and unjustifiable cruelty caused by President Trump’s executive order is now on full display here at Seattle International Airport, and the gross incompetence and ineffectiveness of this action . is on full display here at Seattle,” Inslee said. At Sea-Tac protesters holding signs and chanting “no hatred, no fear, immigrants are welcome here” gathered Saturday evening. Aayah Khalaf, a Muslim American, was sitting at home watching the protest on television when she and her friend studying from Egypt decided to join the rally. It was her second time joining a protest. The first one was the Women’s March. “It’s not just against Muslims. It against environmental rights and human rights overall. I think everybody has to stand up against this,” said Khalaf, 29. Meanwhile, protesters briefly shut down a light rail line at Portland International Airport, and hundreds of protesters also converged at John F. Kennedy Airport in New York where 12 refugees were detained Saturday under the order.